What are you going to do with that thing? This is the most frequently asked question I get. For starters, I'm going to be able to say "I drove a tank to work today, what did you do?" I am a military history buff, and when I saw my first Ferret 20 years ago it was love at first sight. So, to answer the question, I'm going to drive it, work on it, and lavish it with attention and money. Just like a boat, motorcycle, or girlfriend. What the heck is that, a tank? Ok, the Ferret is not a tank, it is an armored scout car, designed to explore enemy territory and send back information. It was fast for it's day and well armored but was not a slug it out on the battlefield type of vehicle. It's mission was to get in and get out fast! See the home page for the history of the Ferret. The armor can withstand up to 50cal rounds, good to go for small arms fire like AK47s and 30cal machine guns. How fast can it go? The Ferret can go about 60mph, but I usually drive mine about 50. For an armored fighting vehicle that's not bad, considering the Ferret is from the 50's and the Main Battle Tanks at that time went about 40mph tops. The Ferret can haul it's own weight (4 tons) quite well, and it can climb and traverse rough terrain. It can also go just as fast foreward or backward. The best answer to the question is "fast enough!" What kind of weapon did it carry? The original weapon the Ferret carried was the Browning 1919A4 30cal machine gun, a standard light machine gun for the US and other armies for many years. The Browning was secured in a mount in the turret, which can traverse 360'. Before Desert Storm my Ferret was upgraded with the newer GPMG, or general purpose machine gun, which was lighter than the 1919A4. The American designation was the M240. It was still a belt fed 30cal machine gun. The driver typically had some type of 9mm submachine gun, like a Sterling, as a personal weapon, and the crew had access to grenades. How can I get one? My Ferret Mk 2/3 came from Khaki Corps, a company in Tulsa Oklahoma offering a selection of tanks and armored cars to the civilian market. Mine cost about $20,000, that was for a vehicle in operational condition. That means everything works. Check out www.khakicorpsimports.com for the latest selection and some really cool photos. The site contains a lot of good information on the vehicles they have for sale. You can also check the web and try to find a cheaper Ferret, but be aware that these cars are over 40 years old and require regular maintenance to run properly, or they won't run at all. If you really want a Ferret, and who wouldn't, you will have to learn the owner's manual and prepare yourself to get dirty on the weekends! 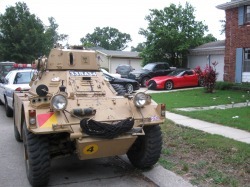 The worst place to get a Ferret, or any military vehicle, is from a Museum. These vehicles need to be run on a regular basis or seals go bad, engins seize, and stuff breaks! Whatever you do, drive it before you buy it!